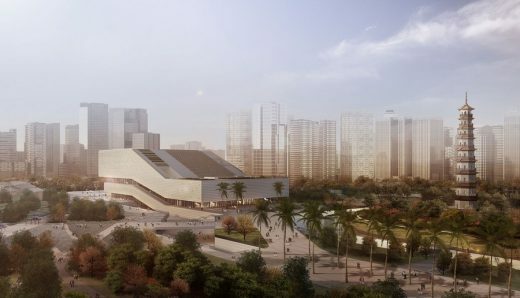 New images of this prize-winning competition entry for Guangzhou City Museum. With the adjacent Science Museum and Art Museum it will form the central cultural precinct of this third-largest Chinese city. The Evangelical Lutheran State Church of Bavaria is inaugurating its new archive in Nuremberg with a special ceremony. The new building, which was designed by architects von Gerkan, Marg and Partners (gmp), took three years to build and is located on a former factory site in the direct vicinity of the existing main building. With 34 kilometres of shelving, the State Church archive now has more than twice the storage space compared to previously and, in addition, accommodates a restoration workshop and enough space for visitor rooms. The architects von Gerkan, Marg and Partners (gmp) together with Knippers Helbig, Structural Engineers, have won first prize in the limited implementation competition for the new construction of a pedestrian and cycle bridge across the Baakenhafen basin in HafenCity. The jury decided unanimously in favour of the design, which was followed in the ranking by two third places for Ingenhoven Architects, in cooperation with Werner Sobek, and R+ Architects, in cooperation with Dr. Binnewies, Engineering Consultants. After a construction period of four years, the city of Gelsenkirchen is this weekend celebrating the opening of its new town hall, which was converted to plans by the architects von Gerkan, Marg and Partners (gmp). 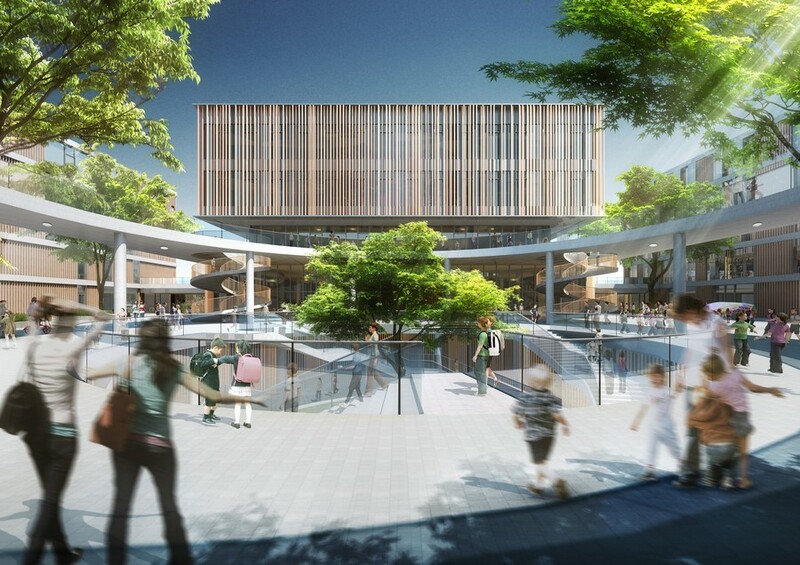 In addition to speeches, tours of the premises and other festivities, gmp founding partner Volkwin Marg, town planner Kuni¬bert Wachten and architectural critic Dieter Bartetzko will be talking about this new building on old foundations in a round-table discussion. The international touring exhibition, “Designing in Dialogue. The architecture of von Gerkan, Marg and Partners”, is hosted by the Chinese National Museum, Beijing, which was converted and extended by gmp Architects. For this purpose, gmp is cooperating with the Chinese architectural magazine UED and Verseidag. With their design for this major new building, the architects won the 1st prize of an international design competition, beating FUKSAS, HHP, NBBJ/BIAD and others. In addition to Shanghai and Guangzhou, Tianjin is now the third city where an exhibition centre of international importance will be built. With a total square area of 1.2 million sqm and dedicated exhibition floor space of 400,000 sqm, one of the world’s largest exhibition centres will be created in the east of China over the next few years. This is the new building for the State Fire Brigade School in Wurzburg. In the summer of 2012, gmp were awarded the contract following a negotiated tendering procedure and the company has now presented its design to Wurzburg’s Commission for Urban Design and Architecture. Hamburg-Harburg Technical University extended by main building Barely two years after the groundbreaking ceremony, Hamburg-Harburg Technical University will be inaugurating its new main building tomorrow, on time for the scheduled completion date. Designed by the architects von Gerkan, Marg and Partners (gmp), a new building comprising both historic and new parts has been created at the site of the former Schwarzenbergkaserne (Schwarzenberg Barracks). The new main building of TU Harburg forms a succinct entrance to the existing campus, which is made up of 14 buildings. The architects von Gerkan, Marg and Partners (gmp) have been awarded first prize in the international competition to build the Culture Center in the newly created Changzhou city center – competing against KSP – Jürgen Engel Architects, Arata Isozaki and other leading practices. With a total floor area of 365,000 sqm, the building in this city of three million, between Wuxi and Nanjing, is six times the size of the Louvre in Paris. The “Red Stadium” was built on the grounds of Alekseevsky Park in Kiev in 1923 for the second All-Ukrainian Olympic Games. Over the decades, it was to be rebuilt and renamed several times. This Ukraine sports venue, which is now called the Olimpijski National Sports Complex, has since been completely renovated for the Euro 2012. After a construction period of two and a half years, von Gerkan, Marg and Partners Architects (gmp) have completed the Tianjin West Railway Station in China. To mark the occasion of the Universiade, which will take place from 12th to 23rd August 2011, the Universiade sports center and Bao’an stadium will be opened tomorrow in Shenzhen, southern China. The international competitions to come up with a design for the buildings were won in 2006 and 2007 by the designs of architects von Gerkan, Marg and Partners (gmp). The sports complex was designed and built by architects von Gerkan, Marg and Partners (gmp), who won the competitive bidding in 2008, and constructed it in under two and a half years. It consists of a hall stadium for several sports and cultural events, a natatorium (swimming hall), an outdoor swimming pool and a media centre. In keeping with a sustainable urban development policy, the SOSC was built on former industrial brownfield land along the Huangpu River. gmp is run by Meinhard von Gerkan and Volkwin Marg. August 13, 2016 in Architects.